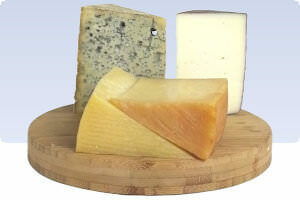 Valdeon - made from a mixture of cow's and goat's milk and well blue-veined (8 oz.). Idiazabal - Smooth, rich and sharp smoked sheep's milk cheese that gives off a warming rustic scent (8 oz.). Drunken Goat or Murcia al Vino - This goat's milk cheese from Murcia is soaked in red wine (8 oz.). Manchego - A cheese that cannot be missed on a Spanish cheese board. We have selected the 8 months old version. (8 oz. ).